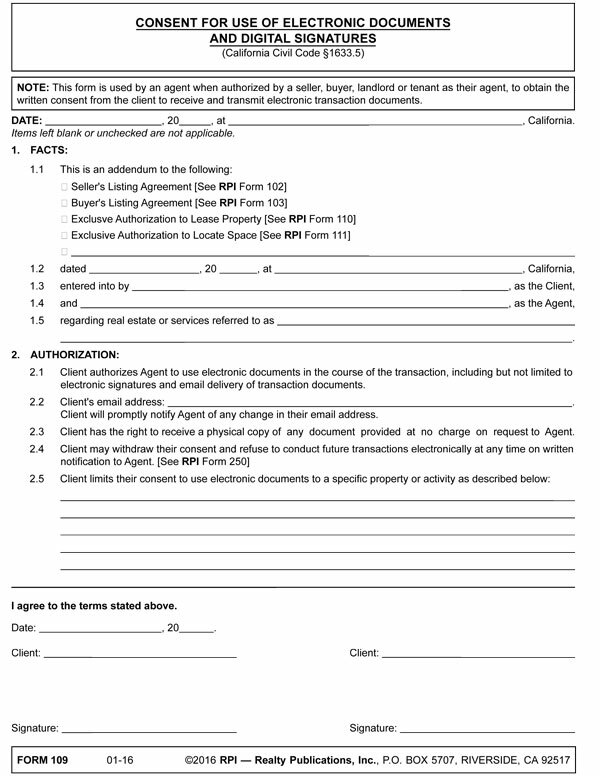 This form is used by an agent when authorized by a seller, buyer, landlord or tenant as their agent, to obtain the written consent from the client to receive and transmit electronic transaction documents. Read on to understand when you may digitize your real estate transactions by using electronic documents and signatures. Real estate is an industry heavy in agreements and disclosures to document obligations and duties performed. With electronic transactions now commonplace, regulations have followed to allow real estate licensees to provide transaction documents – including agreements and disclosures in sales, leasing and mortgage originations – to all participants electronically. As a matter of public policy, a few extraordinary sales, leasing and mortgage-related activates, as well as most post-closing notices, require use of a printed copy, as listed below. Real estate licensees frequently use digital forms, such as portable document format (PDF) files, online applications and software programs that allow licensees to prepare, deliver, store, download (receive) and print documents online or by e-mail. the act of clicking an “I agree” button. Typically, software programs provide for e-signatures in real estate transactions as they are the most secure and easiest methods — Adobe Acrobat and DocuSign, for example. These programs allow a client to create a digital signature they can insert into an electronic document they intend to sign. Transmission of e-documents via e-mail or other online form of delivery protects the signature under these programs. Importantly, programs provide the ability to authenticate the signature and verify the individual named as the signatory provided it. Thus, a client’s digital signature on a purchase agreement creates an enforceable offer to purchase due to the legislatively approved and now common use of electronic transactions. Similarly, real estate agents may use electronic listing agreement forms to create an enforceable agency relationship with a client, as though it were a printed document manually signed by the client. Though most transactions requiring written agreements and disclosures may be conducted electronically, some real estate transactions are excluded from California’s UETA. Editor’s note – Though the above documents are not covered by UETA, licensees may provide these electronically if any other law controlling these documents permits electronic transmission.